Place the vegetable stock, miso paste, soy sauce, star anise and ginger in a large pot, bring to the boil, and simmer for five minutes. Add the noodles, shiitake mushrooms and mangetout and cook for two to three minutes, gently stir through tofu and drizzle with sesame oil. Simmer for an additional two minutes. 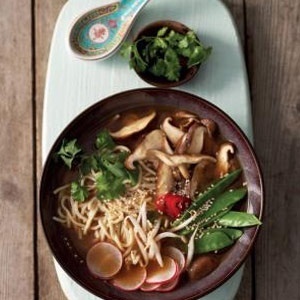 Divide soup between four bowls, top with bean sprouts, radishes and red chilli and sprinkle with toasted sesame seeds. Garnish with fresh coriander.